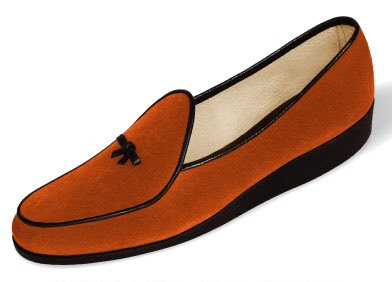 Designed by Henri Bendel in the 1940's, Belgian Shoes are typically canvas and quite delicate. 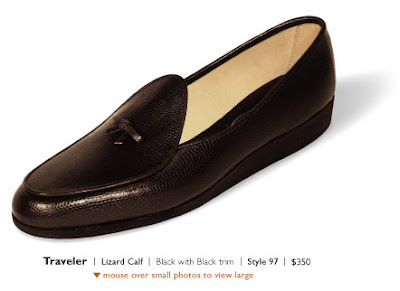 Wear them on a walk from "21" to Bemelman's and you'll find their shape a bit askew and their distinct walabee-like soles quite a bit thinner than after you finished your last sidecar. They are, however, chic and extremely comfortable. Take a cab or a Continental and you'll add some years on to these $300 ducks. They're perfect for an evening out. With socks or without. Because of their design, they are the ultimate plane shoes. If you are prone to swelling feet, these accomodate as much as you give them. But a warning, once you land, don't wear them when you walk the town. Both your feet and your shoes will suffer. 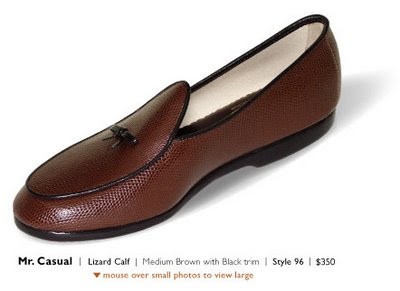 These are strictly for evening and an elegant accent that your feet won't find anywhere else.